Kliff Kingsbury has officially been hired by USC as its new offensive coordinator, the school announced on Wednesday. The former Texas Tech coach is the first new assistant hired to Clay Helton's staff after the Trojans parted ways with defensive line coach Kenechi Udeze, defensive backs coach Ronnie Bradford and offensive coordinator/receiver coach Tee Martin last week. "We are very excited to welcome Kliff to the Trojan Family," said Helton. "He is a brilliant offensive mind and is on the cutting edge of the game today. His offenses have consistently been at the top of the college football statistical rankings. With the talent on our team, along with his leadership and coaching, I truly believe that we can take our offense to new heights." Kingbury was reported to have accepted the offensive coordinator position at USC last Thursday, according to USCFootball.com and TrojansIndiser.com. The coach was also reportedly spotted on USC's campus with Helton early Thursday morning, according to USC Annenberg Associate Professor of Professional Practice Jeff Fellenzer. However, FOX Sports' Peter Schrager reported that the Los Angeles Rams had "reached out" to Kingsbury last week after he was fired by Texas Tech and had discussed bringing him in as an offensive assistant/consultant on Sunday, creating doubt that he'd take the USC job prior to the athletic department's announcement on Wednesday. 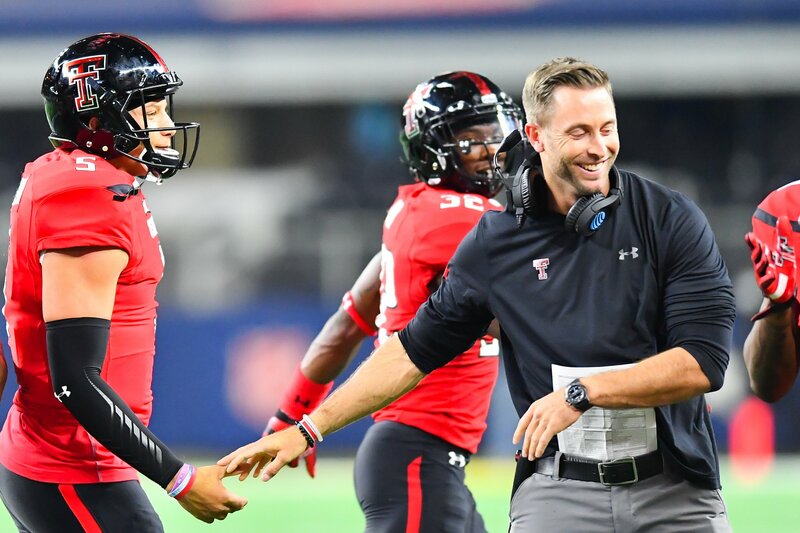 Kingsbury went 35-40 during six seasons as Texas Tech's head coach, but was the only coach in Big 12 Conference history to win his first seven consectuive games. The 39-year-old has excelled as an offensive coordinator and quarterbacks coach at Houston (2008-09) and Texas A&M (2012) before taking over as head coach of his alma mater in 2013. He coached several standout college quarterbacks during his career including Case Keenum, who set several NCAA career passing records at Houston, Johnny Manziel, who won the Heisman Trophy in 2012 at Texas A&M and Kansas City Chiefs starter Patrick Mahomes at Texas Tech. Mahomes threw for 11,252 yards, 93 touchdowns and 29 interceptions, while also recording a 152.0 passer rating playing under Kingsbury from 2014-17. He also recorded 845 yards and 22 touchdowns on 308 rushing attempts. Mahomes endorsed Kingsbury when it was reported that his name was linked to several NFL assistant coaching jobs on Wednesday. Kingsbury was also named FootballScoop.com's National Coordinator of the Year in 2011 and 2012.